Read the newsletters below – although they contain some time sensitive material, the articles are of general interest and relevance. We are pleased to welcome Revd Julian Sanders as our Rural Life and Ministry Advocate for the URC Eastern Synod. Rural Matters is a quarterly publication. Whether you live and worship in one of the villages or hamlets in the East of England, or indeed in one of the towns or cities in this region. Each edition will highlight coming events of interest to people throughout the Synod. Are you part of a rural church? Do you want to focus on mission and making disciples? If so, A Discipling Presence is for you. It contains stories to inspire, exercises and Bible passages to help you reflect and practical suggestions to get you started or move you forward. 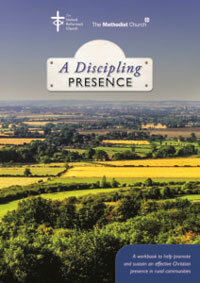 Revd John Proctor, General Secretary, the United Reformed Church ‘A Discipling Presence will appeal to those working in a wide variety of rural contexts and I warmly recommend it to you.’ Revd Loraine Mellor, President of the Methodist Conference (2017/2018). Copies cost £3.49 (plus postage), available from Methodist Publishing (0845 017 8220, Methodist Publishing). The United Reformed Church along with the Methodists employ a rural officer to serve our churches. This is currently vacant but once filled the person will be based at the Arthur Rank Centre at Stoneleigh Park, Warwickshire: A Christian Charity Serving Rural Churches and their Communities. They have an excellent web site dedicated to the needs and issues of rural churches and aim to equip and resource them. This is a constantly changing website with up to date worship materials available. RuSource Briefings is a free rural information service for anyone working in the countryside or with rural people, and those supporting rural life. The briefings are produced by the editor, Alan Spedding, whose goal is to, "Cut important issues down to essentials and tell it straight", saving subscribers to the weekly e-news bulletin hours of time searching the internet for up-to-date, accurate & unbiased information. Alan also provides less frequent 'Easy Guides' to key areas of agriculture & land-based activity for the educated 'outsider'. Follow RuSource on Twitter here. RuSource on Twitter features a different briefing most days and spots and retweets links to up to date rural information. Flooded fields, soaking crops, volatile milk prices and a desperate effort to cut hay to provide winter food for the animals are just a few of the problems that farmers have faced this summer, making it hard for some of them to celebrate at this year’s harvest festival. At the time of year when we traditionally give thanks for the year’s bounty Farm Crisis Network (FCN) is asking for help in its role of supporting farmers and their families who feel overwhelmed by their troubles. FCN volunteers understand the isolation of working alone and the difficulty of leaving the farm so they ‘walk with’ farmers and offer a telephone Helpline service to those who feel unable to cope. The volunteers help farmers and their families find a way to overcome challenges that can seem insurmountable without a confidential, listening ear. Bringing together Churches and Mission Agencies - sharing insight and experience. The Localism Act is a very significant piece of new legislation in its own right. Combined with the draft National Planning Policy Framework it could provide significant opportunities and challenges for rural communities across the country. As the last paragraph of the following summary states the Act could effect a significant change in national life, passing power to a local level, creating space for local authorities to lead and innovate, and giving people the opportunity to take control of decisions that matter to them.